Coccidiosis is an intestinal disease caused by intracellular protozoal parasites (Allen and Fetterer, 2002). Coccidiosis occurs when pathogenic populations of the causative agent rapidly build up. Most coccidia in poultry belong to the genus Eimeria, which are highly host-specific. There are seven pathogenic species of Eimeria affecting chickens, five affecting turkeys and one affecting ducks. 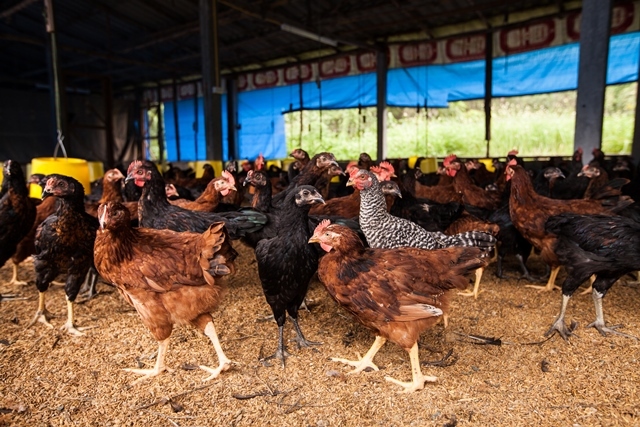 Although there may be some differences between poultry management systems regarding the degree of risk from coccidia, it is generally accepted that the disease may be found in most systems, both indoor and outdoor. The sporulated oocysts contain four sporocysts, each containing two sporozoites and the mechanical and acidic environment in the gut result in the release of these sporocysts and sporozoites into the gut. The sporozoites invade the duodenal mucosa epithelial cells before undergoing phases of growth and multiplication with periodic release of merozoites into the gut. These oocysts require moist conditions to undergo sporulation, a process that requires oxygen and takes about 24 hours, at which point they become infective. Typically, the disease is seen in birds of 3-6 weeks old, before they have acquired immunity. Infected birds will have ruffled feathers, and a breakdown in intestinal function is the first recognisable symptom of coccidiosis, blood in the droppings may be observed depending on the strain of coccidia affecting the bird. The extent of the pathogenicity depends on the species of parasite, numbers of infective (sporulated) oocysts in the environment and the age and susceptibility of the birds. The most virulent strains will cause diarrhoea and a sudden increase in flock mortality. Less virulent strains will result in poor growth and reduced feed efficiency. There is normally a reduction in feed and water intake (Williams, 1996). Hence, the losses resulting from coccidiosis are variable. Most scientific knowledge on coccidiosis has been obtained from chickens as it is in commercial poultry that this parasite causes the most damage due to the fact that birds are reared together in large numbers and high densities (Peek and Landman, 2011). Coccidiosis rarely occurs in layers and breeders as they have generally acquired immunity to this disease, although in situations where there is an immunity breakdown all pathogenic Eimeria species may cause an abrupt and severe drop in egg production for three to six weeks. Any recovery from severe infection can take 10-14 days, and it takes longer to reach pre-infection production status. There is likely to be variation within a flock with regard to the response to infection. Within a single infected group there will be individuals dying whilst others will remain healthy. Sub-clinical infection may mean that some birds will take longer to eat, and as a result may become stunted. This will result in uneven groups, which can cause marketing problems in table-bird flocks. The most common form of the disease is caecal coccidiosis, caused by Eimeria tenella. This normally occurs between 4 and 6 weeks of age. A small but sudden rise in mortality may occur and dead birds will have an anaemic appearance. The outbreak tends to occur amongst a single group or house. It is very important to treat when the disease is first seen. Tissue damage and changes in the intestinal tract, as a consequence of infection, may allow colonisation by other harmful bacteria, such as Salmonella typhimurium, or Clostridium perfringens, which causes necrotic enteritis (Van Immerseel et al., 2004). Coccidiosis may be diagnosed at post-mortem by the presence of characteristic lesions in the intestinal tract, although rapid changes in the intestine more than one hour after death may not allow easy identification. Microscopic examination may reveal the presence of oocysts, but not necessarily indicate clinical disease. Faecal egg counts can be used to detect coccidial oocysts, however high levels may be seen in dung samples without disease being present. E. necatrix and E. tenella are the most pathogenic in chickens. Infection with E. tenella can be recognised by blood in droppings and around the cloaca. Other important less pathogenic strains affecting chickens include E. acervulina, E. maxima, E. praecox and E. mitis. The most important species of Eimeria which cause disease in turkeys are E. adenoides and E. meleagrimitis. The causative organisms are identified and classified by morphological characteristics, their location in the intestines, histological examination of lesions and size of meronts in mucosal smears. These are time consuming and expensive. Coccidial infections can be confirmed by the presence of oocysts in the faeces, however, the presence of these can have little or no relationship to an impending or existing infection. Although still necessary, they are now complemented by molecular methods that involve PCR diagnostic assays based on DNA amplification (Chapman, 2014). If a farmer is struggling to control a coccidia, it might be beneficial to a farmer to determine the species of Eimera on the farm to enable a more targeted treatment strategy. Birds reared on litter are always at risk. High stocking rates and the resulting environmental conditions are important factors. Warm, wet and under-ventilated conditions are ideal for massive parasite multiplication. When birds are in direct contact with their droppings, then the risk of infection is greatly increased. Oocysts may remain in buildings from a previous batch of birds, and they may be carried by mechanical means, including equipment, clothing, insects and other animals. 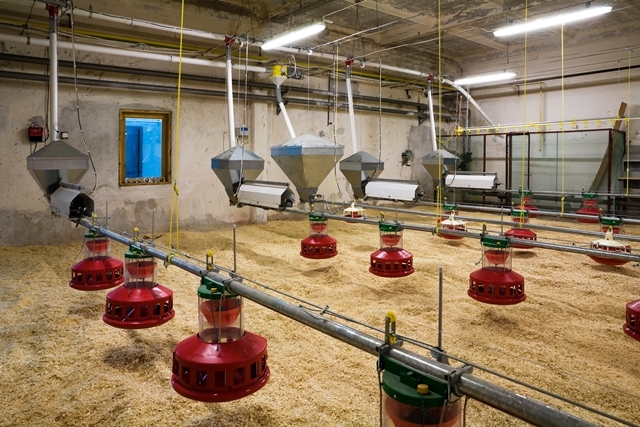 Susceptible birds introduced to an contaminated building will quickly become infected. Graat et al. (1998) examined risk factors on 144 broiler farms and found that poor hygiene related to personnel, feeding and drinking was important, as were the presence of other diseases on the farm and if Eimeria species were found in the previous flock. Whole wheat feeding, compared with a complete ground and pelleted feed, has been shown to increase parasite development during infection with the E. tenella. This might be explained by modifications of digestive physiology and intestinal microflora by whole wheat (Gabriel et al., 2003). However, it is not clear if this is due to poor gut health generally and dietary deficiencies. Day old chicks do not normally acquire passive immunity from hens, although the potential of maternally transmitted antibodies as a means of control has been investigated (Smith et al., 1994a, 1994b; Wallach et al., 1995). Birds of all ages are susceptible. Chickens can develop immunity after infection, but this immunity is species-specific, leaving birds susceptible to other Eimeria species. Immunity to Eimeria species is acquired gradually and is not complete until the birds are 7 weeks of age – up to this age is therefore the critical period of risk. Usually immunity will be acquired by a flock by “trickle” infection without the occurrence of clinical disease. However, if environmental conditions, such as wet litter, promote sporulation, birds that have not acquired immunity (typically 3-6 weeks) will succumb to clinical infection. Feed – if feed is not palatable or available birds will eat their own faeces thus increasing the number of coccidial oocysts they ingest. Immunosuppressive diseases, such as Marek’s disease, infectious bursal disease (IBD) and others, interfere with the development of immunity, and infected birds can be more susceptible to coccidiosis (Biggs et al., 1968). It is impossible to completely remove coccidial oocytes from a farm environment. Hence, control should focus on producing environmental conditions that substantially reduce the number of infective oocysts. It has been shown that coccidia oocysts are able to withstand some disinfectants, although they are killed by noxious gases such as ammonia and methyl bromide. However, good husbandry is fundamental in preventing coccidiosis spreading around the farm. Oocysts can be disseminated by faeces, litter, invertebrates, vermin, personnel and vehicles. It is advisable, with good management, to allow some exposure to coccidia so as develop immunity in birds. Poultry litter should be kept dry in particular in areas near drinkers and feeding troughs. Keeping litter dry paying special attention to areas near drinkers and feeding troughs can assist in minimising oocyst sporulation. The location of watering facilities in particular can be critical in the control of litter dampness. Feeders and drinkers should be kept at a height that faeces cannot contaminate them. Furthermore, since older animals may produce very large numbers of oocytes that may be lethal when ingested by young chicks, it is best to keep age groups separate. Coccidial vaccines have been used to a limited degree by the poultry industry for about 50 years. Their effectiveness hinges on the recycling of initially very low doses of oocyst, and the gradual build-up of solid immunity (Allen and Fetterer, 2002). They have been used primarily to protect breeder and layer flocks (Shirley et al., 1995). However, their use, particularly in broiler flocks, is increasing (Allen and Fetterer, 2002). There are many different coccidiosis vaccines available, discuss with your vet or other adviser which vaccine and administration route are best for you. Note that vaccines – particularly those that cover many Eimeria species – are difficult to produce and may sometimes be unavailable. In order to achieve sustainable coccidiosis control careful husbandry in combination with vaccination could be considered. 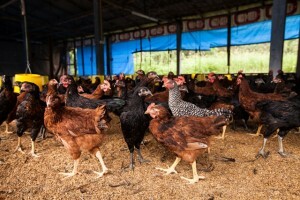 Some producers prefer not to use prophylactic treatments to control coccidiosis in poultry, and to treat animals therapeutically when signs of infection occur. Such a strategy does allow the development of natural immunity, but requires high levels of management and vigilance to avoid serious outbreaks. A number of natural products or feedstuffs have been tested as anticoccidial dietary additives. The mounting problem of drug resistance of Eimeria species has prompted major research efforts to seek alternative means of control through increased knowledge of parasite biology, host response, and nutritional modulation. As a consequence, important advancements have been made, particularly in defining parasite antigens that have potential use in vaccines, defining the Eimeria genome, understanding the immunology of coccidial infections, and the practical applications of live vaccines (Allen and Fetterer, 2002). There have been some very good results with feeding oregano extract or essential oil to chickens (Giannenas et al, 2003, Batungbacal et al, 2007), with evidence that oregano essential oil exerted an anticoccidial effect against E. tenella, with treated chickens showing body weight gains and feed conversion ratios no different to the uninfected control group (Giannenas et al, 2003). However, one study found that oregano may only be effective in birds that were not already vaccinated against coccidia (Oviedo-Rondon et al, 2006). Many products are available for prevention or treatment of coccidiosis in chickens, via both feed and water, with withdrawal periods ranging from 0-10 days. Some drugs can be used to treat the disease and support the build up of immunity, whereas others only treat infection at the time of administration, with follow-up doses required. Coccidiostats suppress the development of the parasite and coccidicidal drugs kill the parasite. Anticoccidials should not be used in laying hens because of possible drug residues in eggs for human consumption. There is some research to suggest that dried leaves of Artemisia annua, which also has anti-malarial properties, have been shown to have anticoccidial properties against some species of Eimeria when given as an in-feed supplement (Allen et al., 1997). It was been found effective in reducing oocyst output from both E. acervulina and E. tenella infections when fed at levels of 8.5 and 17 ppm in starter diets. The mode of action is also thought to involve oxidative stress. (Allen and Fetterer, 2002). Efficacy of extracts from 15 different Asian herbs were tested for anticoccidial activity, including Bupleurum chinese DC, Sophora flavescens Aiton, and Artemisia annua. Of these, extract of S. flavescens was the most effective. P. koreana, S. acutum, U. macrocarpa and Q. indica were also effective. (Youn and Noh, 2001). Coccidia are almost universally present on any poultry farm, but clinical disease only occurs when susceptible animals ingest a large number of sporulated oocysts, so control should be focussed on preventing these birds from getting clinical coccidiosis.